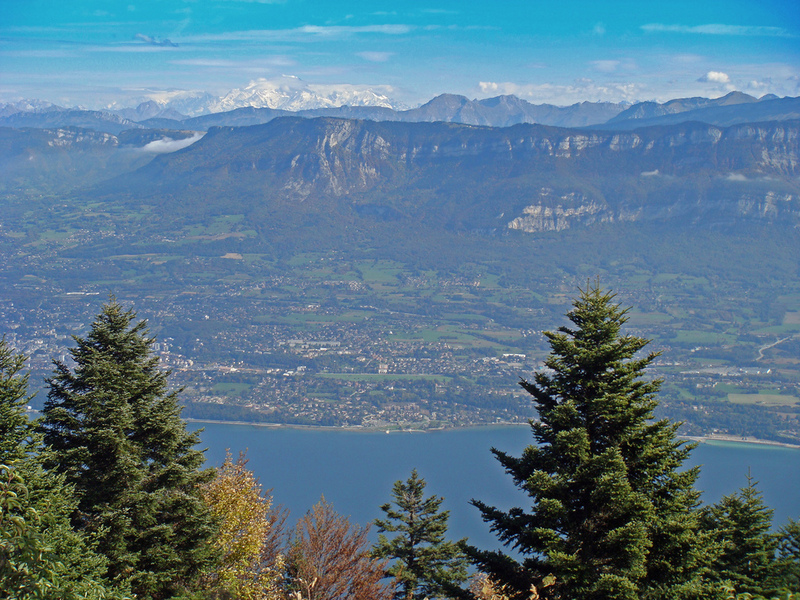 Mont Revard is the big Massif just north-east of Chambéry, overlooking the south-east side of Lac du Bourget. Its imposing cliff face dominates the views east and the roads up need to cycle around behind these cliffs from either the north (Aix-les-Bains) or the south (Chambéry). 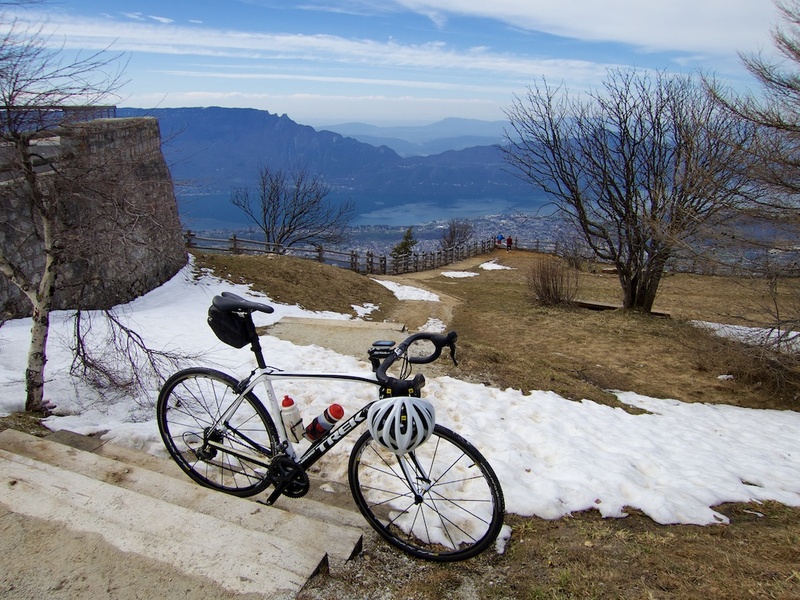 For details of the Aix-les-Bains climb see here. My plan today was a big counter-cockwise loop, investigating the bike paths down low, and climbing Revard from Chambéry. Mont Revard has appeared 4 times in the Tour de France (1965, 1972, 1991, 2013) – twice being a mountain top finish. In 1965, Felice Gimondi beat Poulidor to win an individual time trial. In 1972, with legs so sore he couldn’t walk, Cyrille Guimard beat Eddie Merckx to the top. I started in the spa town of Aix-les-Bains on the banks of Lac du Bourget. The first 20 kilometres are flat and on bike paths. Beware, the first 5 kilometres, beside the lake, can have lots of pedestrians. If you want to go faster, take the busy-ish road – it has a bike lane. But me? I enjoyed slowly riding beside the water. 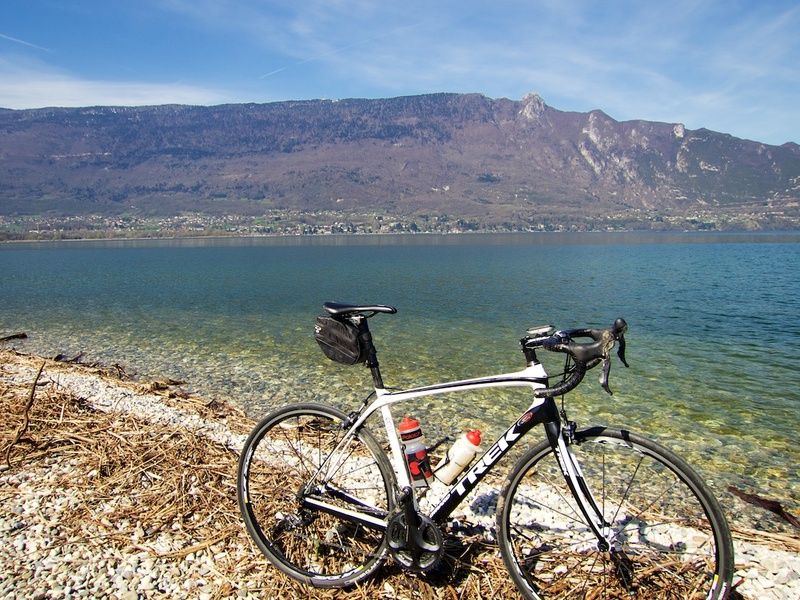 For more cycling routes near Lac du Bourget – see here. 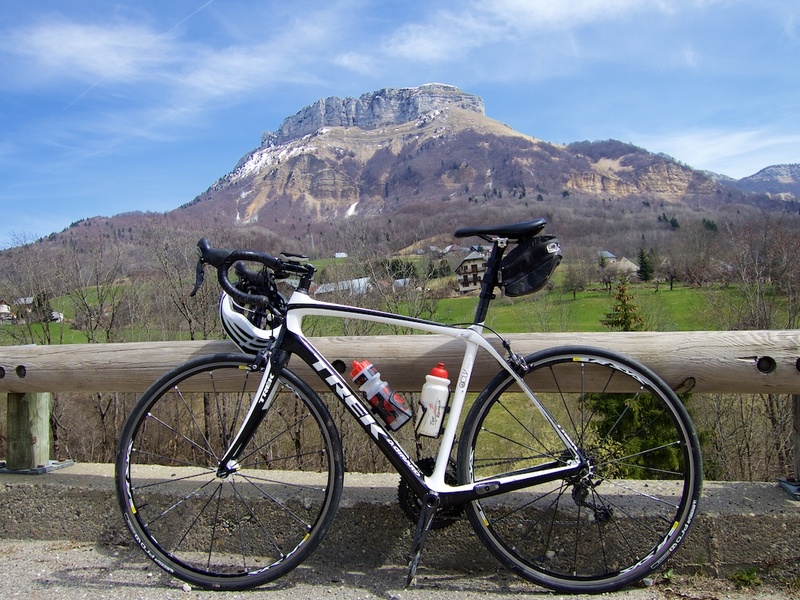 At the south tip of the lake, the route becomes a quieter bike path all the way to Chambéry. Excellent. After 20 kilometres, it’s a few tricky kilometres passing right through downtown Chambéry. Although impressively, just about every road has good bike lanes. Leaving the city, look for signs to “Massif Des Bauges” – mountains! 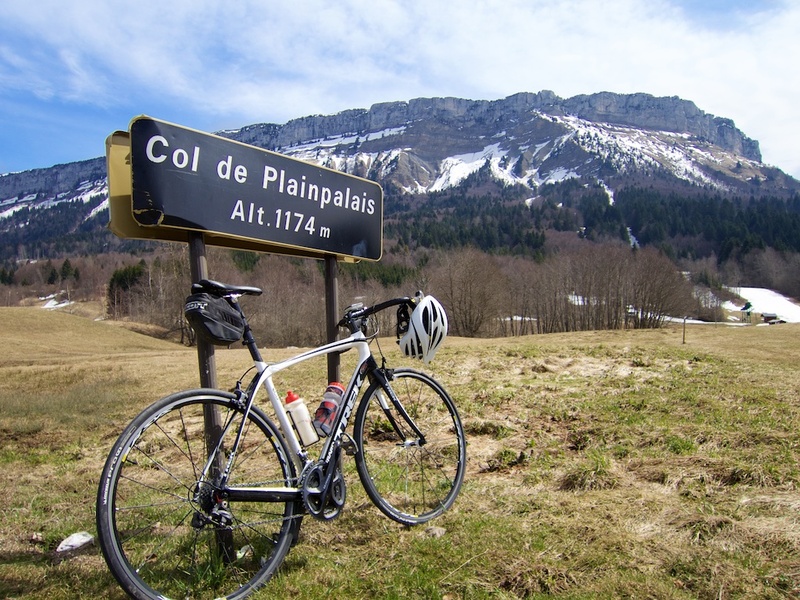 There is a slightly steeper more direct route to the summit at Revard, but I decided to first visit Col de Plainpalais. I took the little extension to Revard and the restaurant look-out point. The photos don’t do the great views justice. I enjoyed this loop. 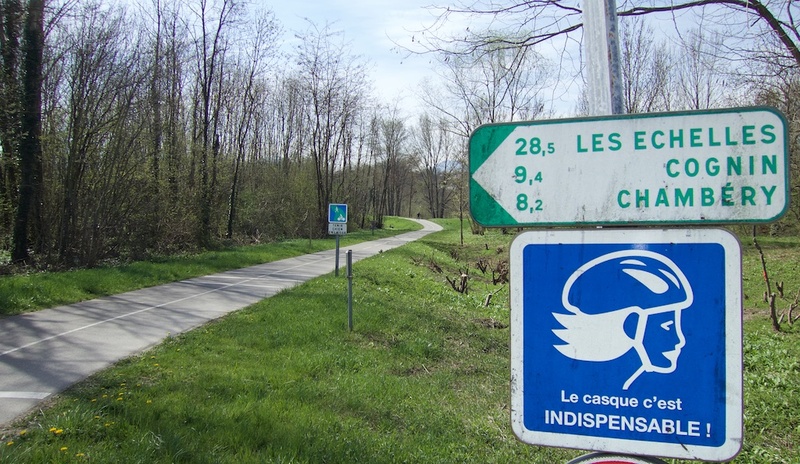 Down low, the bike paths make the traverse between Aix-les-Bains and Chambéry a pleasure. And the climb itself is big and fun. My next Revard project may be to explore a way up by mountain bike. DID THIS TODAY. GREAT CLIMB THROUGH THE MIST UNTIL WE GOT ABOVE IT ALL. SUPER COLD AT THE TOP AND ON DESCENT CHASING THE DAYLIGHT. KEEP UP THE GOOD WORK. YOUR SITE HAS BEEN A REAL FIND FOR US IN THIS SABBATICAL OF CYCLING IN THE ALPS. ANY TIPS FOR DEC/JAN WITHIN AN HR OF BOZEL? January near Bozel? Wait for a perfect sunny day and cycle up to Val Thorens? (avoid Saturday of course as ski change over day). I suppose in that area the main ideas have to be ski stations.